Does the ghost of Julia Staab haunt La Posada Resort and Spa, which was once her Santa Fe home? I was told she did when I stayed there a couple of years ago. 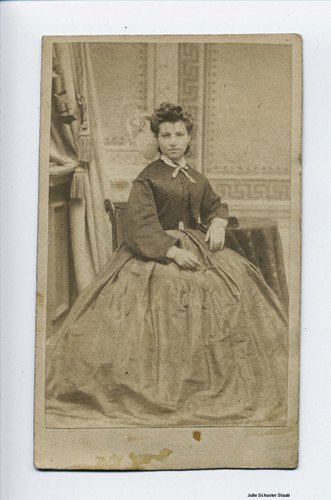 Julia's descendant, Hannah Nordhaus, heard the stories too. She set out to uncover the truth about this pioneer woman whose 19th-century path led her from Germany to the frontier town of Santa Fe. Nordhaus had inherited quite a tale: "Julia had suffered in the house, according to the gossip that floated, ghostlike, from Santa Fe bar to restaurant to gallery to stuccoed home. She had lost a child in the room above the La Posada bar and had shut herself in her chamber for weeks. When she emerged, her once black hair had turned completely white. The child was her undoing, the rumors said: after the loss, she became a shut-in. She took to her room and stayed hidden away until she died. Nor was her death peaceful: she killed herself, the stories said -- hanged from a chandelier, or overdosed on laudanum. Perhaps she was murdered." Her answer is one of my favorite books I read this year, American Ghost: A Family's Haunted Past in the Desert Southwest (2015), which uses a popular contemporary ghost story as a springboard into a frontier history, Jewish history, women's history, and the history of medicine and mental health. The journey Nordhaus takes yields insights both for her personally and for readers' understanding of our relationship to the past. * "Ghosts of Santa Fe: Julia Staab, The Gentle Ghost"
And here is a video: "Ghostbusters Investigate Julia Staab's Ghost At The La Posada Hotel." "There, Xeroxed and spiral-bound, was a tale of a family ecosystem deeply out of balance -- forbidden love, inheritance and disinheritance, anger and madness. There were drug addictions, lawsuits, brother against brother, madhouses, penury, and suicides. There were fatal wounds to the 'bosom.' These were Julia's children; their story branched from hers. And it was clear to me, from Lizzie's book, that the family was haunted well before Julia became a ghost. I wondered what had gone so wrong." Oh, that's perhaps the scariest thing - the things people are really haunted by... This sounds really interesting, thanks!